This past week saw the first of three week-long workshop that will rhythm the semester on quantum Hamiltonian complexity at the Simons institute (I’ll count the boot camp was the zeroth-such workshop). Dorit Aharonov, John Watrous and myself co-organized the workshop around the theme of “quantum games and protocols”. The general idea was to investigate the strengths and limitations of quantum machines — depending on the context, quantum computers, quantum provers, quantum adversaries, etc. — in interactive scenario, both quantum and classical. This included questions such as the possibility for delegating quantum computations through classical means, the problem of verifying quantum mechanics, the power of multi-prover interactive proofs with entangled provers, the quantum PCP theorem, two-party cryptography, device-independence, and more! Umesh Vazirani gave a very nice, focused introduction to the problem of “testing for “quantumness””. Many explanations are often put forward to justify the power of quantum computing: exponential-sized vector spaces, complex amplitudes, the measurement rule, etc. Umesh argued that none of these ingredients by itself is sufficient to distinguish quantum states from probability distributions; rather he pointed to the subtle combination of entanglement, the observers’ freedom in choosing a measurement basis, and the quadratic nature of the measurement rule — vs — as the “magic combination” that underlies the irreducible “quantumness” of our world. Umesh then broadened up significantly by outlining some of the far-reaching implications of this simple difference: by allowing for the rigid testing of quantum states and measurements through the CHSH game this particular form of “quantumness” leads to a host of applications, from randomness certification to device-independent key distribution and delegated computation. Daniel Nagaj delivered a fast-paced and beautifully illustrated talk on the diverse clock constructions used in proofs of QMA-hardness results for restricted classes of local Hamiltonians. Daniel argued that all known (and foreseeable) constructions of clocks necessarily have a spectral gap that closes as , where is the number of gates in the encoded computation. Although the exact scaling could possibly be fine-tuned for each specific construction, it places a strong limitation on any attempt at constructing a local Hamiltonian that would satisfy the quantum PCP desiderata. I found Daniel’s talk very helpful in clarifying why known QMA-hard instances have a closing promise gap. The current reductions all go through the analysis of the low-lying eigenspaces of sums of local Hamiltonians, where we often think of one of the Hamiltonians as a small perturbation of the other. The resolution to which this analysis can be done depends on the spectral gap of the larger Hamiltonian; the smaller this spectral gap the smaller the promise gap one will be able to maintain. 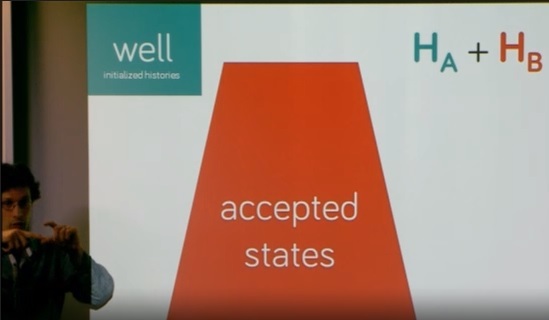 Since the Hamiltonians that are manipulated, such as the clock Hamiltonian, tend to have vanishing spectral gaps, this is reflected in the final promise gap (watch Daniel’s talk — in slow motion — for more details!). As we know, large spectral gaps tend to impose strong structure, and this appears to be a significant difficulty on the way to quantum PCP. Fernando Brandao described a striking implication of his recent de Finetti theorem with Aram Harrow. Their result essentially implies that “naïve gap amplification” is impossible in the quantum setting, in the following sense: any transformation of a local Hamiltonian that simultaneously at least (i) squares the degree of the constraint graph, and (ii) squares the local dimension of the qudits, must necessarily reduce the (relative) promise gap. This is highly counter-intuitive because classically, the operation which takes a constraint satisfaction problem and maps it to its “square” through parallel repetition achieves (i) and (ii) and furthermore has the effect of increasing the promise gap by a factor roughly . Indeed, this is exactly the goal of parallel reptition; the Brandao-Harrow result shows that this most direct method of amplifying the gap will not work in the quantum setting. On Tuesday morning were two talks exploring the hardness of multi-prover interactive proof systems. 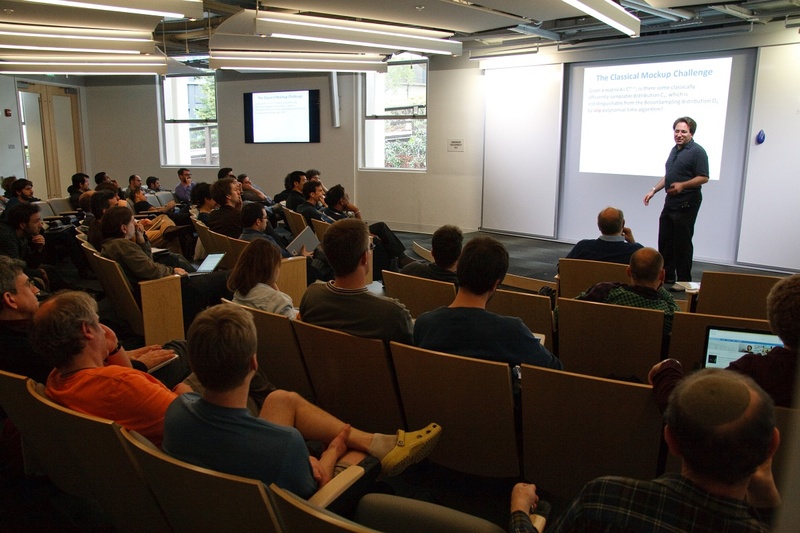 The first talk, by Dana Moshkovitz, presented recent progress on the “sliding scale conjecture”, which aims to devise PCPs with optimal trade-off between the verifier’s randomness, the alphabet size, and the soundness. Dana hasn’t resolved the conjecture (yet), but she presented strong progress by describing a low-degree test with very good soundness parameters. The test is obtained through the parallel repetition of existing low-degree tests, but the analysis goes through a new way to think about the resulting test, as a “curve vs curve” (instead of “line vs line”) test, where the curves intersect in multiple points. The second talk was given by by Zhengfeng Ji. Zhengfeng presented a comprehensive overview of the few hardness results that are known for the case of entangled provers, including a nice description of the key techniques used in the proofs. These include the design and analysis of various small “sub-games”, such as the consistency game, the confusion game, etc., which I hope will find further applications (see also a more technical whiteboard talk I gave on this topic at the boot camp). Zhengfeng’s talk was followed by a lively discussion on the relationship between inequivalent quantum versions of the classical PCP theorem (video link to come?). Carl Miller and Henry Yuen presented exciting recent works on device-independent randomness certification and randomness amplification. Carl described how a very recent result joint with Yaoyun Shi could be understood as a way to constrain a device to perform anti-commuting measurements, thereby generating randomness irrespective of the underlying state. Henry showed that existing randomness expansion and certification protocols could be composed with themselves in a way that allows for unbounded randomness expansion — the procedure can run indefinitely, with the same constant number of devices, while producing infinitely increasing quantities of trusted random bits! Ran Raz gave a talk on recent join work with Yael Kalai and Ron Rothblum that I really like. They reduce the task of devising a computationally secure one-round delegated computation scheme for languages in time to that of creating a multi-prover interactive proof system for the same class of languages that has the strong property of being sound against non-signaling provers. This reduction is based on previous work, and the meat of their new result lies in devising such a MIP for all languages in EXPTIME, such that the MIP involes polynomially many provers running in exponential time, while the verifier itself runs in polynomial time. Their construction is very involved and combines a number of new ideas to control the soundness error in the protocol; perhaps some of these ideas could be helpful to analyze entangled-prover interactive proof systems. David Perez-Garcia gave a very clear talk on entanglement in many-body systems; more specifically on the problem of classifying phases of matter and how the discovery of phases with topological order provides new motivation, as well as new difficulties, for this task. David’s talk gave the best explanation I had ever heard of the problem (of course I am quite new to this), and I highly recommend watching it to everyone interested in getting a smooth introduction to one of the hottest topics in many-body physics. Thursday morning saw a wonderful trio of talks. The first, by Pablo Parrilo, presented semidefinite hierarchies and their use in quantum information (more specifically, separability testing and the quantum moment problem). Pablo gave a very clear picture of both primal (through sums of squares) and dual (moments) views of these hierarchies. Next Aram Harrow talked about ways to quantify, and use, the monogamy of general non-signalling correlations. He presented a few variants of a recent de Finetti result for such correlations that he obtained with Fernando Brandao. Aram also gave a range of applications for the de Finetti results (for instance, to proving hardness results for free games with entangled players) together with a host of open questions. In the last talk of the morning Patrick Hayden gave us an enjoyable tour of the “fundamental laws of quantum entanglement”. One such law is that entanglement can never be created out of thin air. However, in Patrick’s words, it can sometimes be surreptitiously “stolen”, by using embezzling quantum states. Those are special “catalyst” entangled states from which any other entangled state can be generated by local operations alone (up to precision), while leaving the catalyst essentially unchanged…a fascinating topic! Iordanis Kerenidis gave an hour-long marathon reporting on four years of (team)work (now available on arXiv!) in dissecting, understanding and improving Carlos Mochon’s breakthrough showing the existence of quantum protocols for weak coin flipping with arbitrarily small bias. I found Iordanis’ talk very inspiring — as I told him, the first half of the talk really made me want to work on coin-flipping. It is quite a basic primitive, but besides QKD one of the rare fundamental such primitives for which there is a strong quantum advantage. And its analysis gives rise to such a beautiful, and apparently powerful, formalism for the study of quantum interactions (point games anyone?) that one feels one ought to lay one’s hand on it. The second half of Iordanis’ talk, however, involuntarily served as strong caution from someone who has invested years of effort on the topic: although big rewards may be awaiting discovery, do not expect them to come easily! 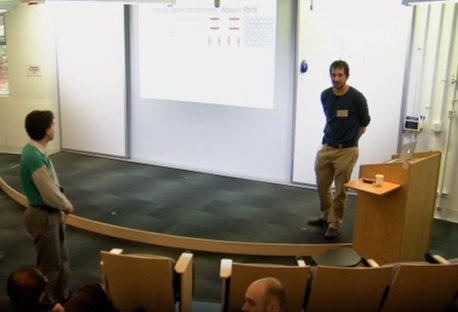 Indeed, Iordanis described some of the more technical (and subtle) aspects of the SDP–point game correspondence, and it is not for the faint-hearted…check out the talk! These are only a few of the many enjoyable talks that rhythmed our week — others included two presentations by Ben Reichardt on his powerful rigidity results for the CHSH game and their use in delegated computation; Joe Fitzimon’s talk on measurement-based delegated quantum computation; talks by Philip Walther and Eleni Diamanti reporting on challenges in experimental implementation of quantum cryptographic protocols; a survey of quantum zero-knowledge proofs and quantum proofs of knowledge by Dominique Unruh, who emphasized the key role played by quantum rewinding techniques; a beautiful talk by Amit Sahai on his breakthrough result on program obfuscation; a follow-up talk by Paul Christiano describing a tentative protocol for quantum obfuscation of classical circuits; a playful but dense introduction to a very fruitful connection between the theory of quantum games and tensor norms in operator spaces by Marius Junge; a survey on the problem ofparallel repetition and direct product testing by Irit Dinur, including her recent work with David Steurer proposing a new, algebraic (they call it analytical) framework for proving such results; two back-to-back presentations on the first comprehensive entangled-prover parallel repetition results by André Chailloux and Attila Pereszlényi; a talk by Jamie Sikora presenting an improved understanding of a certain class of coin-flipping protocols; a beautiful talk by Zeph Landau giving a a tensor-network view of coin-flipping protocols (directly inspired from the Gutoski-Watrous framework for the description of two-player quantum games) that leads to a simple proof of Kitaev’s lower bound, and, last but certainly not least, a presentation by Scott Aaronson on his work with Alex Arkhipov promoting Boson Sampling as an experimentally realizable, and verifiable, demonstration of “quantum supremacy”. All in all this turned out to be a very intense, but also very gratifying, week. As an organizer I feel like we were extremely lucky to have not only an excellent line-up of speakers but also a formidable bunch of enthusiastic participants. The whole workshop was very interactive, with lots of interruptions, questions, and small-group discussions taking place during and after the talks. The building in which the Simons institute i hosted made this possible by providing us with a beautiful auditorium, including windows letting the natural light in and a fairly flat structure (only five rows) that encourages participation, as well as ample (and pleasant) discussion space in the upper floors. If anything I wish we had managed to keep a slightly lighter schedule, to allow even more time for discussion. Aall the talks were attractive and well-attended, and by Friday afternoon we were all pretty tired…I was very impressed that many participants still had the energy for the lively open problems session that ended the week on a high note. Once again, a very heartfelt thanks to all the participants; I am looking forward to the next two workshops of what has so far been quite an exciting semester. This entry was posted in Conferences, Simons and tagged qhc semester, quantum crypto, quantum information, simons institute, talks. Bookmark the permalink. Thanks for your post. I see that there’s no video for the open problem session. Will the problems be posted online? The first few problems were recorded, before the session went out of control 🙂 The video should be posted next week.